We’re a little bit late on the Player Of The Year voting on the PGA Tour, and are aware that Tiger Woods was named the winner. It’s hard to argue with that, as Woods won five times on the season, including the PLAYERS Championship and two World Golf Championship events. But we want to argue the case for another player. That would be Phil Mickelson, who very surprisingly has never won the Player of the Year on the PGA Tour before. That’s thanks in large part to the man who won it against in 2013. While Mickelson was three wins behind Woods in the count, he certainly was in contention in plenty and won the one event that everyone said he would never be able to. 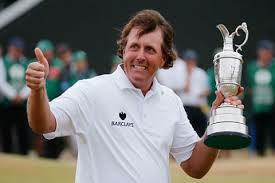 Mickelson captured the British Open this year thanks to a final round 66. It was a round that will go down as one of the greatest in the history of golf. But consider this, Mickelson himself never thought he would be able to win the British Open; to tailor his game such that he could be successful in the demanding conditions overseas. Then he comes in an fires the round of his life, one month after recording his sixth runner up finish in the U.S. Open? Talk about intestinal fortitude. To have a bounce back like that and not let the disappointment of the U.S. Open loss get to him, regroup and win the British Open. That has to be worth something. Certainly winning golf tournaments is a big deal, but sometimes you have to consider the intangibles of the situation and the year a player had. In golf, it’s about seizing the biggest moments on the grandest stage. Mickelson was able to do that, while Woods was not. Let’s put it in other terms. Mickelson was two strokes away from hands down being the player of the year in a walk. That would have been due to the win at the U.S. Open and a win at the British Open. How close was Woods to that? This entry was posted in Opinion and tagged 2013 british open, 2013 pga tour player of the year, 2013 us open, phil mickelson, tiger woods on October 10, 2013 by Bryan.